Visit the famous Shwedagon Pagoda in Yangon. Enjoy the two-hour hike and trek to the summit of Mt. Zwekabin. Explore the beautiful & interesting islands in Mawlamyine. Visit Kaw Gun Cave which features different votive tablets, clay Buddha images and Mon inscriptions. This compact 7-day trip will let you experience the untouched beauty of Myanmar. During this trip, you will visit caves, untouched villages, and explore the nature in these amazing cities. You will also learn the culture and have a taste of Myanmar's gastronomy. It's refreshing to escape from big cities and embrace the uniqueness and simplicity of these small towns and get to know the locals of Myanmar. Your experience in this short tour will be etched in your memory for a lifetime! Are you ready to start this adventure? Once you arrive in Yangon, you will be warmly welcomed by your guide and transferred to your hotel. Yangon, also known as South East Asia Garden City is a combination of old and new. 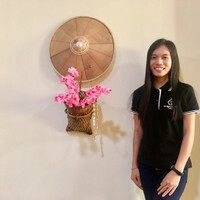 You will see modern business buildings, historical and cultural heritage of century-old golden shimmering pagodas, impressive old colonial mansions that sit side-by-side bustling restaurant and bars.You will visit Sule Pagoda and Bogyoke Aung San Market, Chaukhtetgyi Reclining Buddha, and the famous Shwedagon Pagoda! Your first day is already filled with impressive sightseeing in the city. You must be excited to see what's in store for you for the next days! After breakfast, you will go on a long but pleasant drive to Hpa An along the scenic road. Hpa An is a small town famous for its large, bizarre Buddhist caves and sacred mountains! 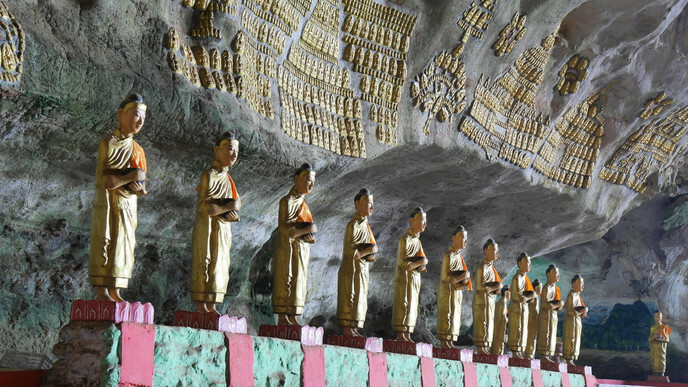 You will visit Kaw Gun Cave which features different kinds of votive tablets, clay Buddha images and Mon inscriptions. You will find terra-cottas on the walls of the natural limestone cave! This is one of the highlights of the trip that you shouldn't miss! After your delicious breakfast, you will visit the foot of Mt. Zwekabin, the landmark of Kayin State. Mt. Zwekabin is considered one of the most sacred mountains in the country. There is a pagoda that sits on top of the mountain which is said to encase Buddha's hair. The base of the mountain is beautifully lined up with several thousand identical Buddha statues. You will enjoy the two-hour hike and trek to the summit of Mt. Zwekabin. This is one of the highlights of the trip and it is definitely a rewarding site to see the panoramic view of the surroundings from the top of the mountain. Make sure you bring your camera with you! In the morning, you will visit the city center and walk around the busy market before heading to Kan Thar Yar Lake with Mt. Zwekabin as a scenic backdrop for a brief photo stop. You will visit the beautiful Saddan Cave filled with buddhas and pagodas. On your way to Mawlamyine, you will visit the magnificent U Na Auk Monastery with beautiful woodcarving. Once you arrive in Mawlamyine, you will be transferred directly to your hotel to rest. Today, you will explore the city of Mawlamyine. You will visit the bustling and colorful Zeigyi (central market). Wander through the market and observe the locals sell their products. They sell dry goods, from inexpensive ‘bale’ clothes to housewares. Then, you will also visit the Judson Baptist Church, and Kyaik Thanlan Pagoda, the city’s landmark. You will definitely enjoy the panoramic views over the city. Next, you will visit the ancient Queen Sein Don Monastery and Holy Family Cathedral. After lunch, you will take a short boat trip across the Thanlwin River to Gaungse Kyun (Shampoo Island). You’ll walk around the island, visiting the Buddhist meditation center and Sandashwin Pagoda. Before you end your day, you will proceed to the View Point to enjoy the beautiful sunset! After breakfast, you will drop by Bago on your way back to Yangon. Your visit in Bago will begin at Shwethalyaung Temple which houses a beautiful 55- meter long reclining Buddha. Then, you will proceed to the Mon-style Shwemawdaw Pagoda and the well-restored former palace, Kambozathadi. Make sure to take a picture of these beautiful and famous highlights in Bago! You will continue your drive to Yangon and stay overnight at a hotel. The rest of the night is at your own leisure. This will be your last opportunity to explore the city and say goodbye to amazing Myanmar. This may be the end of your beautiful journey but you will still have time to explore the garden city on your own. It's time to say goodbye to Yangon. You will be transferred to the airport for your next destination.